Did you know texting, also known as SMS (Short Message Service) is the most widely used data application globally? With 2.4 billion active SMS users, the business and marketing possibilities are endless! Solution Consultants is an SMS provider for media and businesses. We offer cutting edge SMS marketing and provide a fully managed service requiring no external development with dedicated account access via a secure web login. Short codes are memorable numbers customers use to send texts such as responding to a promotion or registering interest in a product. This is highly effective in engaging prospects and generating immediate sales leads. 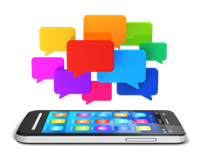 Premium rate SMS marketing used by an increasing number of businesses to strengthen their promotional mix. Lower deployment cost and fast delivery make this SMS and MMS perfect for time sensitive marketing promotions.